MEMECS amis to spread out the culture of M & E principles and applications through both private and public sectors. Alaa is working as a consultant and a freelancer international trainer for Total Quality Management and Six Sigma. She established her own professional training firm in Iraq in corporation with the international academy for building capacities- Lebanon. 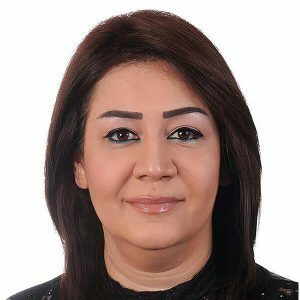 Alaa have worked in academic work and training ever since 1993 and is a former team leader and then head of department of the Iraqi ministry of higher education. Alaa‘s career began in the field of teaching and learning and developed several projects including organising awareness workshops for supporting women against violation, and workshops for introducing the importance of technology in education . Alaa is the CEO of training academy (www.futuretrainingacademy.com) and her academy offers training course in Management, Education, Supply Chain and Lean Production, Soft Skills, Trading and Marketing in addition to consultancy services and providing support for educational system development. MEMECS aims to spread out the culture of M & E principles and applications through both private and public sectors. نهدف الى نشر ثقافة إلى نشر ثقافة مبادئ وتطبيقات الرصد والتقييم من خلال القطاعين العام و الخاص.